The following is an interview of ASA Hall of Famer Jack Whitaker conducted by Fran Healy on his MSG Network talk show, "Halls of Fame." 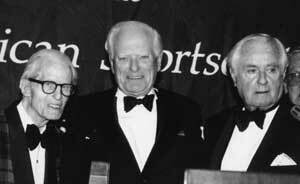 Whitaker won the 1979 Emmy Award for Sports Personality and has as many awards in his trophy case as sporting events he's called. 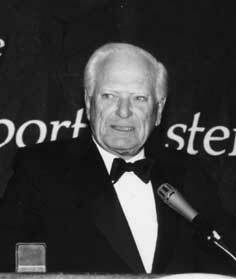 He was inducted into the ASA Hall of Fame in 1998. Fran Healy: Tell us about your childhood. Jack Whitaker: I was born May 18, 1924 and grew up in Philadelphia in a neighborhood called East Germantown. It was during the depression. It was kind of tough in a way but I look back on it as great times. I played a lot of sandlot baseball and some stickball. FH: How did you develop an interest in broadcasting? JW: I litened to the radio a lot. I was kind of a sports and news junkie. Actually, that's how I got started, as a newscaster and newswriter. But I had what I thought was a normal healthy love of sports which meant I knew a little bit about baseball and college football. When I got into the business I realized I didn't know too much at all. FH: Tell us about your schooling in Philadelphia. JW: I went to a great sports school, North East Catholic High School. They had very good football and baseball teams and sent a lot of players to the majors. Then I went to St. Joseph's College. At the time I went, right before the war, they dropped football but it was a great basketball college. It still is. Now it's a university. Right after the war, a lot of small towns that never had radio stations were assigned them by the FCC. Hundreds of these stations opened up and that's how you got a job. I was very lucky. I got into a 250-watt station in Pottsville, Pa., where you learned to do everything. You cleaned the machines off when you came in. You put on the local mayor and the local pastor. You had to rewrite all the copy that came in. So it was invaluable experience. I was there two or three years when I realized that TV was coming up so I returned to Philadelphia. There was a Columbia station that needed a five-minute newscaster and that's how I got in. FH: When you were in college, you had an interest in broadcasting. What did you major in? JW: Liberal Arts. I was in the debating club, the drama club, but I was always interested in radio. I was really into the news. I liked sports but it wasn't my thing. The only reason I became a sportscaster was the sportscaster at WCAU quit and they asked me if I knew anything about sports. I said I did so they hired me. That's when I realized I didn't. FH: After graduating from St. Joseph's, you realize you want to get into radio so you go to this small town. How did that come about? JW: One of my classmates was working at the station in Pottsville and he said they were looking for somebody. So I went up and took an audition and I was hired at $32.00 a week. FH: Now you feel that TV is coming up and you decide to head back to Philadelphia. Did you just quit and go back? JW: Yes. I was working in Allentown. I had moved up to a 1000-watt station. I came in one June afternoon and realized I wasn't going anyhwere at this station. They had a TV set on in the office and I looked up and Bobby Cruickchank was putting out on the 18th hole in the U.S. Open and I said to myself, 'That's what I should be doing.' So I quit my job and headed back to Philadelphia to look for a job. By August I had found a job and around labor day I started At WCAU. FH: So you started as a newscaster at WCAU. Then what? JW: Well I became the sportscaster there and we had a pretty good run. We were number 1 in the city. In fact, they changed me from 6 0'clock and put me on at 11 and I thought that was the end of my career. But the 11 to 11:30 turned out to be pretty good. We had John Facenda as the newscaster, I was sports and Ed McMahon did a five minute essay piece at the end. So they were 12 very nice years until CBS bought the station and they cut back to just 15 minutes and they cut out the sports and made me a weatherman. So I thought that was the end so then I started to go to New York. Ed and I would go every morning on the train to New York and make our rounds at the agnecies and the networks and come back. Finally Ed hooked up with Johnny Carson on "Who Do You Trust" in the afternoon and through the network owning the station where I worked, I started to get work at CBS Sports Network. FH: This is wild. So you and Ed McMahon are going to New York from Philadelphia in the morning while you have this night job. You take the train up together. Do you go to the agencies together? JW: Yeah. We would go to the agencies together. Not always together. We would find out where they were having auditions and make our rounds. It was a spooky but fun time. FH: So now you're working for both CBS in New York and the local station in Philadelphia. Tell us about your relationship with CBS in New York because now you feel that Philadelphia, where you work at WCAU, is kind of on the back burner. JW: Philadelphia was still major but I was picking up some nice money on the weekends doing football. Then for a while I had perhaps the best job in all of television history - standby baseball. CBS had the "Game of the Week" with Dizzy Dean and Buddy Blattner but to get insurance against a rainout, it was cheaper for them to put a whole second crew, and I was part of that crew alond with Frankie Frisch. So while Dizzy and Buddy were out in Chicago we would sit in Yankee Stadium. When they were in Cincinnati we'd be in Washington. And I think in 3 ½ years we were on the air for a total of five innings. But we got paid every week And of course, being with Frisch I really got a PhD. in baseball. FH: So now you're going deeper into sports but your first love was broadcasting news. JW: Yes, that was the first thing I thought about and I think about it every now and then. News isn't as much fun as it used to be either so I' m pretty happy with what I did. You just think after a while, they are games, aren't they? And maybe we should be doing something a little better but I have no complaints at all. Sports was great in those days. I saw the beginnings of the National Football League. I saw baseball go and drop and come back. I've seen the tremendous rides of pro golf and the NBA. It's been quite a historical travel. FH: Now in the broadcasting profession would you say being on the air has always remained the same or has it changed? JW: I thik its changed. Attitudes have changes. FH: What do you mean? JW: People don't look at things the same as we did in the 50's, 60's and 70's. I think there's a much more adversarial relationship between brodcasters and athletes now. When I was growing up in the business in the New York days, we were all friends with the athletes. We used to hang around together. That's changes a lot. FH: Is that good or bad? JW: I don't know. It may not be too bad because you shouldn't really be friends if you're going to be a good reporter. But what I think that they're missing is that they don't get access now the way we got access. And a lot of it has to do with economics. The ball players now are making a lot more than the televsion people. It used to be the other way around. FH: What has been the biggest change you've seen in the broadcasting field since you've started on air in sports? JW: There has been a tremendous advance in technology but I don't know if the editorials have kept up that much. JW: Yeah. I think so but I'm talking like an old geezer. This isn't true of the older people still working like Vin Scully. They have great discipline. But I don't see the discipline in the younger people like we had or we tried to have. FH: Did you have a favorite sport to broadcast? JW: I would think my favorite was Track & Field, believe it or not. JW: Because it's the basis of all sports. And I found those Track & Field athletes, when I was doing it back in the 60's and 70's, to be more introspective than any atheletes I've ever interviewed. FH: They tell us you should never become emotional in what you're broadcasting. I believe, and correct me if I'm wrong, it was Pimlico. Did you do a horse race where a Philly had to be destroyed. JW: That was at Belmont where Roughian broke down and they had to destroy her. FH: How difficult was that? JW: That was a tremendously difficult afternoon. Actually during the pre-race stuff we were so mad because we didn't like the features they were doing. And the next thing you know, nobody knows about it because this was just a stunning thing to see this horse which many thought would be the best ever. She won all her races. She won every race until that one when she broke down. And so it was a very wrenching time. It's always wrenching when you see a horse go down or a human athlete for that matter but that was a particularly trying time. FH: Greatest single event you ever were involved in as a broadcaster. What was it? JW: I would say it was Secreteriat's win at Belmont which was the most dominating preformance I have ever seen by any athlete, even more than Tiger Woods last year. Because he won by 31. I mean it just blew me away. It blew everybody away. People were crying. It was just perfection. So I think I'll stick with that, although Tiger is pretty close. FH: Who's the greatest two-legged athlete you ever broadcast in an event? JW: Wow. That's pretty tough. Jimmy Brown was the best runner I think I've ever seen carry the football, although Gale Sayers was also great. Who was the best passer? Who was the best hitter in baseball? Who was the best all-around. It's really tough for me to do. I really can't give you one. FH: Most athletes grew up having an idol. As a broadcaster, did you have someone you admired when you were first getting into the business? JW: Oh sure. I always looked up to the people that I was lucky enough to work with later. People like Curt Gowdy and Byrum Saam, who was the Philadelphia announcer. I always thought he was very good. Chris Schenkel. People like that. Vin Scully. As I said, I was fortunate enough to work with them later on. FH: If you had one event that you weren't involved in but would have liked to have broadcast, what would it be? JW: I guess I would like to do Wimbledon or the French Open. I have never never done those. Other than that I've been pretty lucky. I've done Super Bowls, World Series so I guess it would be those two. FH: When you first started broadcasting, correct me if I'm wrong, it was one announcer in the booth? FH: I know in baseball it then evolved to also having a color man in the booth. Was that an easy adjustment for you? JW: When I started there were two of us. So I was never there in the single days except when I did the radio stuff. CBS had a marvelous radio thing with college football. Red Barber sat in New York and he called out to the country the big games. If there was a big game in Philadelphia I'd be the guy in Philadelphia. If it was in New York it would be Vin Scully. And you would give a summary of what hapened and two minutes of play-by-play and shoot it back. That was fun. One man in the booth. The two men in the booth was fine. I had no problem with that as long as you had the chemistry with that person. My instruction to any young man trying to be a play-by-play guy is the same as Spencer Tracy told a young actor once, just memorize your lines and don't bump into the furniture. Just know your numbers and don't bump into your color man and everything will be fine. Three men is a problem for me. JW: Too much I think.Too much furniture to bump into. FH: For years broadcasters presented the facts. They talked about exactly what was going on. Now there seems to be a lot more to the broadcast. Is that good or bad? JW: I think it's good if it helps you enjoy the game more or understand the player more. I don't think it's good if you're just looking for scandal or cheap entertainment values. I don't want to cost anyone a job but I have yet to see any news come out of a sideline reporter. I think what the younger people are doing on television is taking what we did wrong and making it bigger. They talk too much. And that's part of the new world so I may be wrong about that. But in our days everybody was sitting on you telling you this isn't radio they can see the pictures. Don't say he swung and missed. But then again it's hard for me to judge because it's a completely different world than I grew up in and it's hard for me to appreciate a lot of them. FH: If you didn't broadcast, would you be in the theater? JW: I don't know. After I graduated from college I went to Fordham and entered the acting school. I lasted for two days and went over to the radio. I love the theater. I was in plays in college and it was great fun. And I think it was great training for speaking on your feet or appearing public or whatever. I would have liked the theater but I'm just as happy that I spent my life in television sports. FH: Did you have any regrets about anything you did? JW: I often wonder, and I'm still wondering, if I shouldn't have left a little earlier and tried something else. Either news or producing or writing or something like that. I don't know. I've had a very good run and been very lucky. Who knows. FH: Were "The Good Old Days" better than today? JW: No. They never are. They're good old days because we were younger. I expect that we might of had more fun and the athletes might of had more fun. You know Fran, in those days baseball, football, basketball players, they had to take jobs in the offseason to augment their income. So when their playing days were done they had something to fall back on. Now we've got instant millionaires. What happens at 33 when you don't do anything for the rest of your life. I don't know. FH: Talking to a lot of the guys who broadcast both radio and television, they usually have a preference. What would be your preference? JW: I think radio because you've got to paint the picture in radio. In television the picture is already there. Jack Gould, who was a critic for the New York Times, the first television critic for the New York Times, once said, 'Television sports announcers are glorified caption writers.' I got so mad but then I thought about that. I said that's pretty good because if you could write a caption to a New Yorker cartoon, a caption that makes the picture even better, then you're pretty good. So that's what I tried to take. But that was my challenge in television. Radio is for creativity.